Three very busy weeks, both with paid work and one week as Bernina Ruler Guru at the Melbourne Craft and Quilt Fair, then a week holiday with my mum, has left me a little behind on my Farmers Wife schedule. 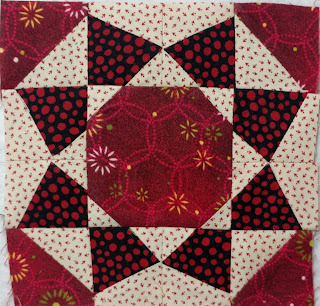 I have made one block this week, a little fiddly, but a nice one. I should have made some blocks in advance, but I really had trouble just functioning at a basic level just to get the rudimentary things done. I also have taught 4 quilt classes in the past few weeks. So many quilters have amazing tools and equipment and need some encouragement to use them to their best advantage. I have really enjoyed these classes, but go home quite exhausted. My word to you is that if you have bought 'tools' to enhance your quilting- try them out, take them to your group to troubleshoot and then go home and practice practice practice! If all else fails, watch a youtube video! 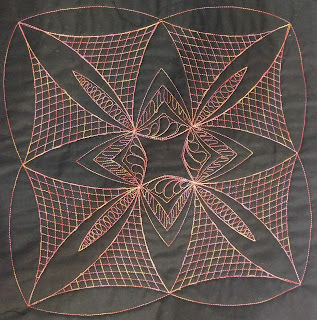 In these classes I have found new 'tools' to enhance and improve quilting, some are great , but some so fiddly, that I wonder if they are really going to help the average home quilter, or just confuse and frustrate? One of my own 'tools' that is wasted on me is the triangle cutting ruler, I have had it for about 15+ years and used it twice! I usually cut a square then stitch and cross cut for half square triangles, it does give more stability when stitching, especially with small blocks. My 6" x 24" and 6 1/2 " x 6 1/2" and 12 1/2" x 12 1/2" rulers are perfectly serviceable for my needs. I have been working with Bernina at the Craft and Quilt Fairs to demonstrate the Bernina machine quilting rulers. I love using these rulers, and have been having some fun with my Cindy Needham Ultimate Stencils to create some fantastic and fun mandala style blocks. It is amazing to think that with a few basic curves and a straight ruler I can create amazing shapes. 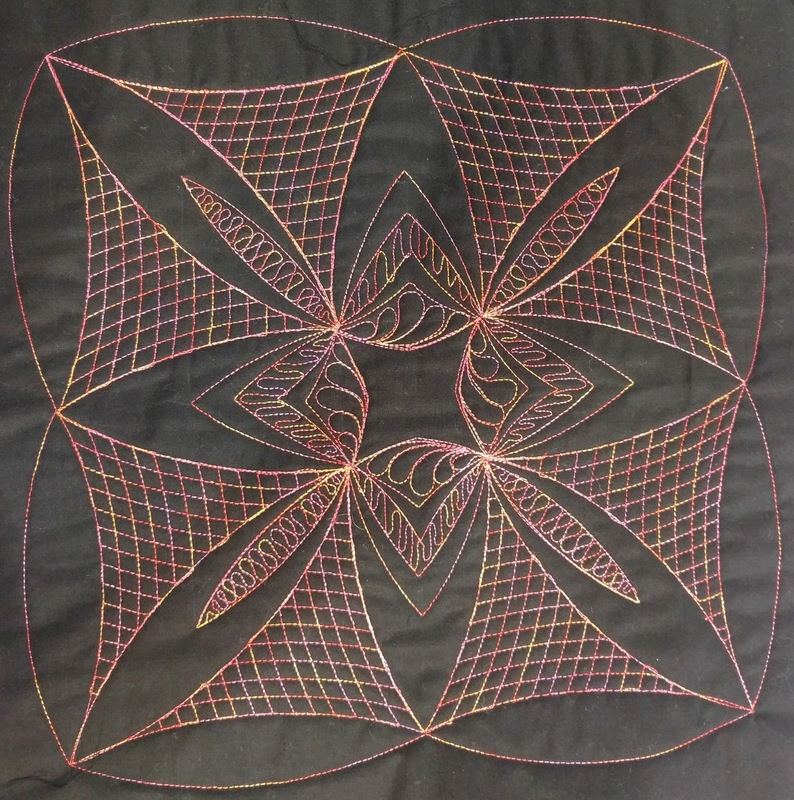 I am not using fiddly rulers, sometimes I may not use the whole oval or circle, but I am creating really pleasing repetitive designs. Some pictures below. I also did some really great border designs too, but gave them away before photographing them- lesson learned here. Creating with the stencils is so easy, does not need lots of different shaped rulers, an individual look can be achieved easily and simply with the basic circles and oval rulers found in my Bernina set.